On September 28, 2006, the House of Representatives passed the ‘Iran Sanctions Bill’ HR6198. Representative Tom Lantos, the top Democrat on the House International Affairs Committee, said: "If we fail to use the economic and diplomatic tools available to us, the world will face a nightmare that knows no end: a despotic, fundamentalist regime wedded both to terrorism and to the most terrifying weapons known to man,” . "In the meantime, we cannot shirk our responsibility to employ every peaceful means possible to defeat <?xml:namespace prefix = st1 ns = "urn:schemas-microsoft-com:office:smarttags" />Iran’s reckless nuclear military ambitions,". Allegations have been made that Iran is engaged in a clandestine operation to divert its civilian nuclear program into a nuclear arms program, threatening the world [read Israel]. Igniting a fuse of suspicion, attention has been diverted away from the real threat posed to the world by the imposition of sanctions and threats of military actions. The International Atomic Energy Agency (IAEA) has not found Iran to be in violation of its obligations under the Non-Proliferation Treaty (NPT) and no evidence of weaponization has been found. However, Iran’s nuclear energy program has been built in isolation, under sanctions, and with inferior Russian technology and monitoring. Sanctions and threat of war only exacerbate the situation. It must be reiterated that all Parties to the NPT are entitled to participate to the fullest possible exchange of scientific information for, and to contribute alone or in cooperation with other States to the further development of the applications of atomic energy for peaceful purpose. Iran is a party to this Treaty. Contrary to their commitments under the NPT, the five nuclear power states, Russia, Britain, France, China, and United States, have opted to use this Treaty as a political tool, ‘doling out’ technical assistance to chosen allies. Not only has the spirit of the NPT become obsolete, but in an ever changing turning world, where friends and enemies shift places, assistance based on policies rather than science must surely prompt one to question the sanity of our current world order. Given that fossil fuels are exhaustible, the nuclear industry has proven itself to be a viable source of energy. An increasing number of countries are turning to this source for their electrical needs, developing countries among them. Even environmentalists, who had once shunned the industry, now hail it as a solution to global warming and there is growing cooperation between them and the nuclear industry (Nuclear Power: 58-60)[i]. In spite of these developments, in the anarchy of a politically charged world system, the spirit of collective responsibility is being slighted by the dictates of irrational policies, rendering the international safety of nuclear power plants unobtainable. Regrettably, although the Chernobyl power plant tragedy reinforced the need for international cooperation, politics dominate the arena of decision making while the safety of nuclear power plants are placed in the hands of ambitious policy makers. This tragedy failed to impress upon us the safety culture that is so pertinent in the safe operation of a nuclear power plant. While the extend of human losses from Chernobyl is still unknown, it has been said that the accident caused up to 300,000 deaths (The Economist, April 27, 1991), or it may ultimately claim more victims than did World War II (Read, 1993)[ii]. Yet today, caution is thrown to the wind as the rapid growth of the nuclear industry takes place under sanctions and isolation. Contrary to the fear instilled by politician to further their sanctions and wars, nuclear bearing terrorists, or indeed, nuclear armed hostile states are not the biggest threat facing the United States today. The problem of the safety and security of Russian nuclear weapons and nuclear material has been called the most urgent unmet national security threat to the United States today. This is the conclusion of a recent report by a bipartisan task force that was organized to review and assess the U.S. Department of Energy’s (DOE) nonproliferation programs in Russia and to make recommendations for their improvement. The task force was co-chaired by the former Senate majority leader, Howard Baker, and Lloyd Cutler a former counsel to U.S. presidents (Baker and Cutler, 2001). Yet attention and resources are diverted towards ending a nuclear program in Iran alleged to be engaged in diverting a civilian program into bomb-making. The fiasco behind this is to affect regime change and install a US friendly regime who would sacrifice Iran’s sovereignty. This futile rhetoric is a waste of resource as not only does it leave the international community inadequately protected, but every effort is made to conceal the dangers inherent with the lack of a diminishing “safety culture” resulting from sanctions. History has shown economic sanctions and political reprimands are ineffective in preventing nuclear technology; North Korea and Iraq are two cases in point. Even an Israeli air strike against the Iraqi Osirak nuclear plant in 1981 did not curb their ambitions. Given the determination of countries to reach their goal to be on par with the West, one must therefore weigh the consequences of isolation and sanctions. In 1993 Martin Indyk, the National Security Council's Senior Director for the Near East and South Asia; portrayed Iran to be the world's foremost sponsor of terrorism and assassinations, sounding alarm about Iran’s alleged attempt to build weapons of mass destruction. According to Indyk, Iran sought to undermine the Arab-Israeli peace efforts, to subvert friendly Arab governments and to intimidate the Persian Gulf region by military means. Indyk proposed "dual containment" for Iran and its troublesome neighbor, Iraq. President Bill Clinton signed two executive orders in 1995, banning commercial interaction with Iran (Fairbanks)[iii]. The unfounded sanctions, put forward by Senator Alfonse D’Amato (R-N.Y.) and heavily backed by American Israel Public Affairs Committee (AIPAC), had an immediate impact on Iran’s economy. After the Iran-Iraq war (1988), Iran’s foreign debt of less than $5 jumped to about $30 billion in 1993. In May 1995, due to ban on oil sale to U.S. firms, which forced Iran to accept a discount of 30-80 cents on the oil it could sell, Iran suffered a loss of $100 million to $200 million, as well as the collapse of the Iranian currency (Clawson, 89-93)[iv]. As history has shown, policies of restriction or containment through foreign economic relations do not work. In a porous world, sanctions are largely ineffective and coercion cannot control the flow of nuclear technology among interested countries. What sanctions do contribute to is an increase in the dangers arising from a poor safety culture. As nuclear expert Dr. Najm Meshkati (De Luce)[v], expressed, the danger from Iran’s reactor arises from it being built in secrecy. The secrecy jeopardizes the safety culture of the power plant due to the stress it puts on the staff for reasons which will be elaborated upon herewith. It has been demonstrated that in Britain, the staffing crisis caused by the decision to close Montague’s Peel Park headquarters in East Kilbride could put safety at risk. Among factors contributing to potential risk, low morale of operators was one for an inspectorate report had concluded that the British Energy had failed to relocate its staff from and “the consequential impact has had an adverse effect on the staff with respect to stress, morale and uncertainty over their future.” (Edwards)[vi]. While in Britain failure to relocate had a consequential impact, the Iranian worker deals with far graver personal risks which affect his/her personal safety, imposing a crisis in the safety culture. As the Peel Park reactor demonstrates, low morale among nuclear reactor operators is a critical factor in safety. Learning from history, the 1981 Israeli strike which destroyed the Osirak power plant in Iraq promoted the Iranians to build many of their facilities in secret sites and among populated areas. The secrecy of the employees often puts additional stress on the workers as it isolates them even from their families. Iranian culture, unlike the Western culture, is not centered on the core family. For its existence and survivor, even if only emotional wellbeing, it depends on the extended family and friends. Isolation and Iranian mentality are ill-suited. The pressure of working in secrecy on the nuclear power plants in order maintain its location safe from foreign observers, is an undue stress on the plant operators which hinders the safe operation of the plants. Added to this stress is the ever present fear of an aerial attack by the United States or Israel. A military attack is not far off from the operators’ mind whilst The American Conservative (August 1, 2005)[vii] reports that the Bush Administration is preparing a conventional and even nuclear air attack on Iran’s strategic (translates nuclear and military) sites. Knowing that every day of their lives is a risk, the operators of these facilities must surely have a low morale, rendering the safety culture ineffective. Indeed, it would be hard to imagine an operator thinking of the safety culture of an industry when the industry is the daily topic of an attack by a superpower. Further, the nuclear plant operators risk the possibility of an industrial sabotage as was suggested by Patrick Clawson, Deputy Director for Washington Institute for Near East Policy declared in a gathering at the Woodrow Wilson Center that an industrial accident the scale of Three Mile Island should be put into effect to sabotage the Iranian nuclear power plant. Broadcasted simultaneously on C-Span on November 29, 2004 (Hoover Institution)[viii], this horrific scenario must surely have had a chilly effect on the Iranian power plant staff. This rhetoric is not lost on the Iranian nuclear power plant staff, putting plant safety and safety culture on the back-burner. Aside from safety, in spite of years of operation at the nuclear power plant in Britain, British Energy’s Montague says that there are “reliability problems”, “with one problem being that some of the thousands of graphite bricks that surround the reactor cores cracking, threatening the safe running of the plants.” “[T]he unplanned loss of nuclear generation in the UK was 12-perent in 2002, compared to under 2-per cent in the US.” (Murphy)[ix] . Britain is a member of the NPT, a democracy, and Western country with close ties to the United States. This declared nuclear power is able to avail itself of top of the line technology, including the know-how of a safety culture, yet it has not succeeded to create efficient plants and optimum conditions. It is hard to imagine Iran, under sanctions and in isolation, yet determined to avail itself of its entitlement, accomplish what other countries have failed to do in unison. Not only is it likely to fall short of standards, but it will be afflicted by low morale and stress brought on by the international community which will hinder the formation of a safety culture. These two are the real threat to the world at large, and to the people of Iran, for they are the likely fuse of another Chernobyl accident. The fact that the heads of the G-7 governments spent two days in 1996 to discuss civil nuclear issues with Russian leaders, attests to the fact that the world powers have are concerned with the safety of Soviet designed nuclear reactors (and fissile material safety). Many have sounded alarmed about the possibility of another Chernobyl-type accident (The World Today)[x]. Yet they are dooming a nation for pursuing its inalienable right, and with it, they may be dooming untold others. “Our first duty as scientists is to establish the truth, and in this matter our responsibility to humanity transcends our allegiance to any state.” And: “[F]or the continuation of our civilization and its further development, atomic energy is not merely and aid; it is an absolute necessity.”(United Nations Presidential Speech – 1956). 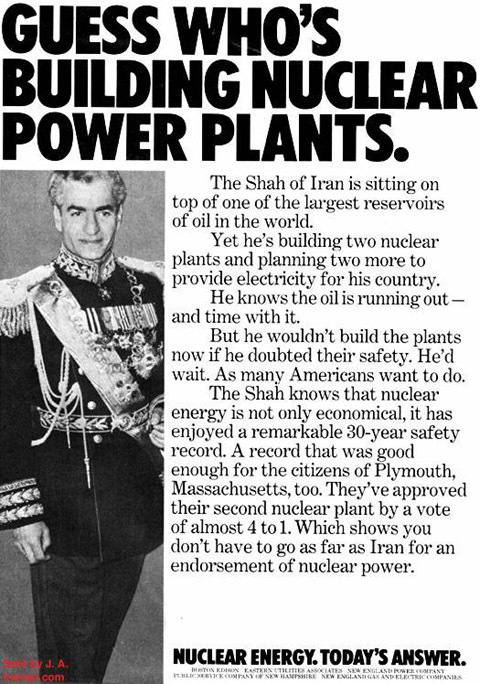 It would seem however, that when it comes to Iran, the United States was only too happy to use the Shah of Iran as a poster boy for nuclear energy [shah]. Sitting on top of all that oil, he made a handsome figure in his uniform selling nuclear power plants for Boston Edison. The French and Germans all cooperated. Perhaps the new regime is not up to modeling. Today, it would seem that Senator Ros-Lehtinen who spends more time defending terrorists than the interests of her adopted country, the United States, has her mind set on war – for they inevitably follow sanctions. Her heart set on the MEK as the future rulers of Iran, she declares: “This group loves the United States. They’re assisting us in the war on terrorism; they’re pro-U.S.” . She champions them and along with like-minded colleagues devotes her time to have them removed from the state list of terrorists. If only she would serve America. Perhaps those others who have ‘ordered’ the imposition of sanctions, should also be reminded that ‘ a nuclear accident anywhere, is a nuclear accident everywhere’. About the author: Soraya Sepahpour-Ulrich has lived and studied in Iran, the UK, France, and the US. She obtained her Bachelors Degree in International Relations from the University of Southern California, Los Angeles, and she is currently pursuing a Masters Degree in Middle East Studies concentrating in Political Science. She has done extensive research on US foreign policy towards Iran and Iran’s nuclear program.